Nihari recipe by Sahar at PakiRecipes.com. Then put in the beef. Put in half of the Nihari Masala. Keep on stirring until the beef is cooked. Pour the Atta in the pot. Heat 1/2 cup of oil in another pot. Fry the onions until they are brown. Slow the oven and add the other half of the Nihari Masala. Mix it for 2 minutes and add it to the Niahri Pot. Cover the pot for 15 minutes. Pour Nihari into a bowl. Decorate it with Hara Daniya, ginger , and green chilies as u wish. I Just Tried it.... It Was So Awesome..... the Simple Most recipe... very delicious..... Thanks for sharing. 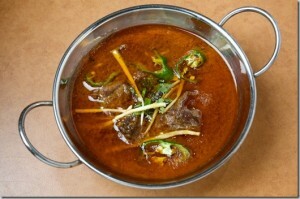 The nihari is delicious its excellent !!! i really like it. Thanks for pointing out the errors. The missing hyphens are added where needed. there is something wrong with the recipe. plz read the timings for stirring. howcome we can keep on stirring until the meat is cooked or stirring time is 510 min. water added is 34 cups,green chillies are 23 and we are cooking nihari in oven. this is ridiculous. 34 cups of water? You are off your head! Are you thinking of making this nihari in the bath tub? Crazy people!